Your holiday begins as soon as you arrive in the beautiful and safe resort of Playa Paraiso (Paradise Beach). As you unwind in this comfortable and stylishly decorated 2 bedroom, 2 bathroom beachside townhouse with fantastic views of the sea and mountains, you will know that you�ve made the best choice. 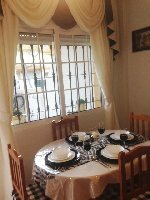 The house is situated in a quiet residental area and has; English Satellite TV, Air Conditioning, access to our communal swimming pool, golden sandy beaches just 2 minutes walk away from local shops and restaurants. The upstairs comprises 2 bedrooms, a double master bedroom and a twin bedroom. 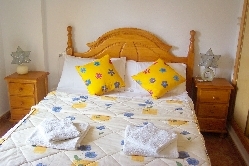 The master bedroom is complete with air conditioner, satellite TV, double wardrobes, a large balcony allowing for sea and mountain views; a large bathroom with bath/shower, bidet and vanity unit. 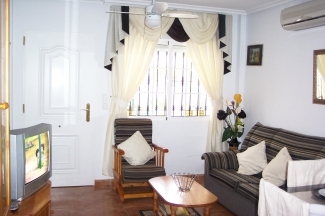 The ground floor boosts a spacious living room that is fully air conditioned (each room also has a ceiling fan). There is a large comfortable 3 seater suite (opening into a double bed) an armchair, English satellite, DVD /CD with large selection of films and music. There is also a shower and toilet on this floor. The dining area has an extendable dining table providing seating for up to 6 people. The kitchen is separate. It is fully equipped with electric oven/hob, microwave, large fridge/freezer, juicer, toaster and complete with cookware and utensils. At the rear of the property is a secluded sunny patio area, ideal for sunbathing or dining alfresco. There is also an outside shower area and free access to a washing machine. 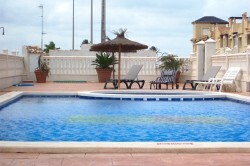 The large swimming pool with an adjoining children�s pool is just around the corner. Playa Paraiso offers the best of both worlds; it�s located in a quiet residential area but also offers a variety of family entertainment in the summer including the ever so popular foam party, disco music, live band and children�s funfair. However, by 1am everything stops and the real party goers can move onto the party strip of La Manga where they can dance until sunrise. Spanish night-life is well known for its ability to start late and finish early, in the morning that is! 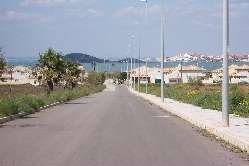 and during the summer months people come from miles away to experience the nightlife of La Manga. Party hot spots include Trips night club, Bongo, El Zeta to name but a few. What nicer way to spend the night than with friends, having a drink and dancing under the stars to the latest pop, funk, house or live Cuban band playing hot salsa music. Things really come alive in the early hours of the morning and offers an incredible selection of music and dancing for those with stamina and no need to be up early the next day. New to Playa Parasio is a fantastic multifunctional sports centre, offering a variety of activities including, football, tennis, basketball courts, gymnasium and Aerobic classes such as spinning, Zumba, pilates and more for under 5� per day or 25� per week. For those who like to spend time recharging their batteries then look no further than the glistening beaches, warm sea breezes and stylish marinas of Cabo de Palos and Tomas Maestre where you can while away the hours outside cosmopolitan bars and restaurants. Away from the Playa Paraiso resorts there's plenty to do. Be sure to save some time to explore the Cities of Cartagena and Murcia, where you'll discover the captivating history, culture and traditions of these vibrant and ancient cities. 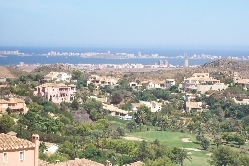 To burn off a little more energy and admire the spectacular, panoramic views of La Manga, take a short drive to the swanky world famous La Manga Club, with its 3 championship golf clubs, 22 tennis courts and football pitches it�s a real enticement for keen sports men and women. The rich and famous are known to flock here with surprise sightings of European footballers in training. And for those who would rather enjoy the views with a leisurely stroll without the sport, a walking holiday in the lush green nature reserve of Calblanque Park is sure to get the heart racing because of the breathtaking views, the variety of migratory birds including Flamingos on route to Africa and the amazing beaches. What's more, for adrenalin-pumping action there is a fantastic Go-Kart racing track, if like Schumacher or Hamilton you fancy a bit of life in the fast lane. 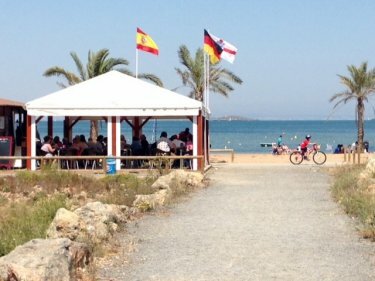 A short drive to Murcia City you will find adventure and aqua parks to keep the whole family amused. All washed down with a generous helping of delicious traditional Spanish cuisine. 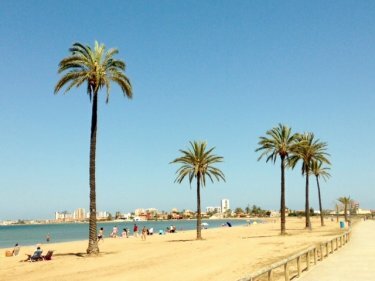 Don�t delay, book your perfect break to Playa Paraiso now and holiday alongside the Spanish. Rates quotes are for up to 4 people,a supplement of �25 p/w is charged for each additional guest. Final cleaning charge of 60� is to be paid on arrival.